Most people are familiar with antibiotics, and people are becoming more and more familiar with probiotics. We stock up on antibacterial soaps and hand sanitizers, and antibiotics are commonly used to treat a wide range of illnesses. However, maintaining the proper balance of good bacteria is just as essential to our health as reducing the harmful bacteria in our bodies. Both probiotics and prebiotics can help. In contrast to bacteria-destroying antibiotics, probiotics introduce healthy bacteria into the digestive system. These active cultures of bacteria serve to regulate digestion and restore the organisms that have been killed by antibiotics. Prebiotics are the newest entrant to the digestive health marketplace. Prebiotics are a type of dietary fiber, but not all fibers are prebiotics. The two shouldn't be used interchangeably. They interact positively with gut microbiome, which is the bacteria that lives in the intestinal tracts. Prebiotics join forces with the naturally occuring "good" bacteria to promote healthy digestion. It can be found naturally in a variety of plants including chicory root, Jerusalem artichoke, onions, garlic, and possibly oat fibers. PepsiCo is entering the prebiotic arena with certain varieties of its Naked Juice line. Probiotics are the healthy bacteria that enable your intestines to maintain a proper balance of microflora. A healthy person’s digestive tract contains more than 400 different kinds of probiotic bacteria, which promotes a healthy digestive system while reducing the growth of harmful bacteria. According to the National Institute of Health, taking probiotics is considered to be safe for most people. One of the largest and most widely known types of probiotics is lactic acid bacteria, which is found in yogurt containing live cultures. Probiotics can be found as an additive in foods or drinks, and can also be taken in supplement form. One of the most common reasons that people develop digestive problems or a stomach virus is that the normal balance of bacteria in the digestive tract is disrupted. Probiotics are commonly used to address uncomfortable or inconvenient digestive issues. Because antibiotics kill both harmful and beneficial bacteria, they can upset the balance of the microflora in the intestinal tract. Probiotics can replace the good bacteria that are lost during the course of an antibiotic treatment. Probiotics may also help treat and prevent other infections, such as yeast infections or urinary tract infections. They may be used to help alleviate diarrhea, prevent infections in the digestive tract, reduce inflammation and control the symptoms of inflammatory bowel disease. Additionally, several recent studies suggest that the proper balance of healthy bacteria can affect how well you age. Prebiotics also work to reduce or alleviate various symptoms of digestive health issues. The fibers in prebiotics promote the growth of many of the good bacteria in the gut. These, in turn, provide many digestive and general health benefits. Recent studies have also shown prebiotics and good bacterial gut balance play a direct role in mental health. Individuals who consume prebiotics on a daily basis have fewer issues with anxiety, depression and stress. Today, probiotics make up one of the leading segments of the dietary supplement market. According to recent independent research, two-thirds of the US population experiences some form of digestive health issues, including indigestion, heartburn, bloat, and pain. As these numbers continue to rise, the consumer market for related dietary products is expected to balloon to $100 billion by 2020. PepsiCo is playing an expanding role in furthering the science of beneficial foods and beverages to consumers through its global nutrition portfolio. While probiotics can be taken in pill form, they can be found in a range of delicious products. A drink popular among the ancient Chinese, kombucha is a sweetened tea that has been fermented by a colony of bacteria and yeast. This drink is rich in B vitamins, antioxidants and glucaric acids. It helps detoxify the body, prevents joint pain and arthritis, boosts the immune system and promotes healthy digestion. This certified organic, vegan, dairy-, gluten- and GMO-free drink contains four strains of live probiotic cultures. 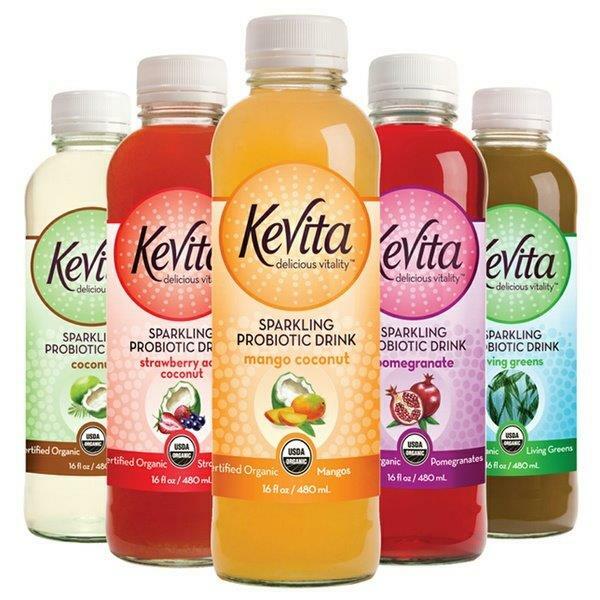 KeVita comes in several sparkling flavors and delivers refreshment while promoting a healthy balance of good bacteria. Kefir is a fermented milk drink that contains up to 8 species of bacteria. Ideal for adults that suffer from lactose intolerance, kefir is easy to digest and helps alleviate digestive discomfort. Kvass is a popular Russian drink that is made from black or regular rye bread. It is commonly flavored with fruits, berries or herbs, and offers rich probiotics and a high Vitamin B content. When combined with a healthy lifestyle, probiotics can promote long term health by encouraging proper digestive function. With so many delicious products available, you are sure to find an easy and satisfying way to incorporate probiotics into your diet.